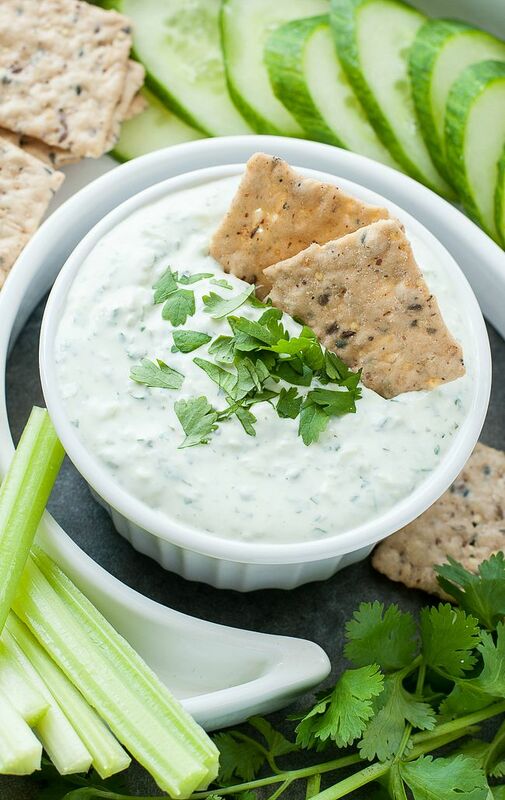 This Creamy Cilantro Cucumber Dip is quick, easy, and so incredibly delicious! Mayo-free and easily made ahead, pair it with veggies for a healthy appetizer or snack. I’m a sucker for a good dip. It’s without-fail the first thing I beeline for at a party or potluck and my go-to snack on the regular. My tiny human shares my dip-thusiasim and will come running at the mere mention of dip at snack time. Not just any dip though, in this case fresh is most definitely best! Next time you start to eye one of those fancy dips or spreads at the grocery store, do yourself a favor and beeline to the produce section instead. Your wallet (and waistline) will thank you for it. It’s super simple to whip up a delicious dip that’s full of flavor and free of sketchy additives! That was me faceplanting into the bowl. What I lack in self control I make up for with VEGGIES! Let’s dive on in shall we? Hooray snack time! We can’t get enough of this cool-as-a-cucumber dip. Combine yogurt, softened cream cheese, cucumber, cilantro, green onion, garlic and salt in a food processor and blend. 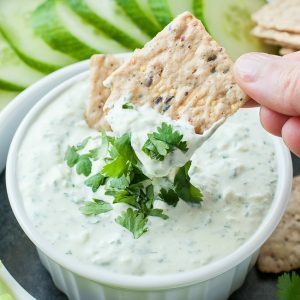 Dunk a cracker to taste and add more of your favorites, if desired or keep the dip as is -- the ratio in this recipe had me swooning! Garnish with fresh cilantro and dive in with crackers and veggies! This delish dip may be made in advance and will keep in the fridge for 4 days for easy snacking or party prep. NO FOOD PROCESSOR? No problem! A blender will work just fine and, for an appliance-free dip, feel free to use a box grater to coarsely grate the cucumber, then simply smash + mince your garlic and finely chop your green onion and cilantro before adding them to the dip. Easy peasy! Plate this tasty dip with a mountain of savory gluten-free Nut-Thins crackers and fresh veggies! It even makes an awesome sandwich spread! Any garlic fanatics out there? Feel free to add in an additional clove or two of garlic, to taste! Amping up the garlic gives the dip a little extra bite to it, which is precisely why my husband begged me to keep this one on the friendlier side with just one clove. He can handle a small mountain of Sriracha or Jalapeños but raw garlic sends him running in circles. It’s a tad hilarious. 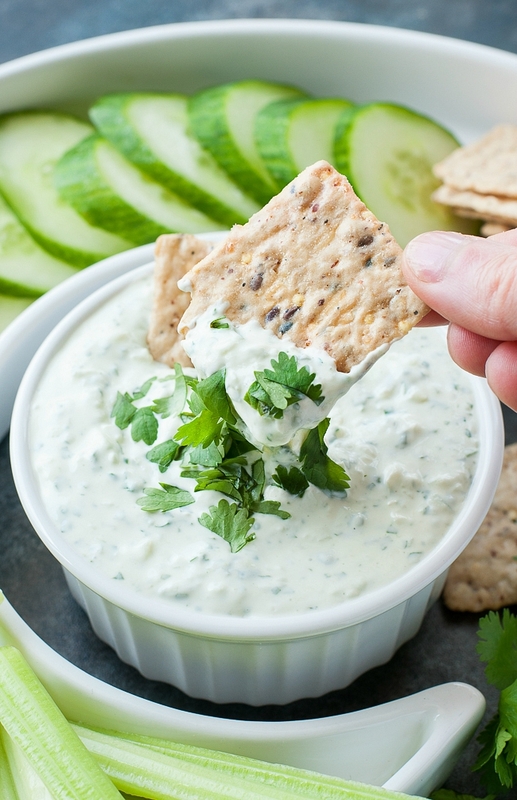 If you get a chance to try these tasty cilantro cucumber dip, let me know! Leave some love in the comment form below or tag your photos with @peasandcrayons on Instagram so I can happy dance over your creation! MAN I love this dip! My friend Katy and I straight up devoured this dip, which reminds me… Katy you still have my bowl! Don’t worry about mailing it from North Carolina, I expect it to be hand delivered. Come visit me — I miss you!!! 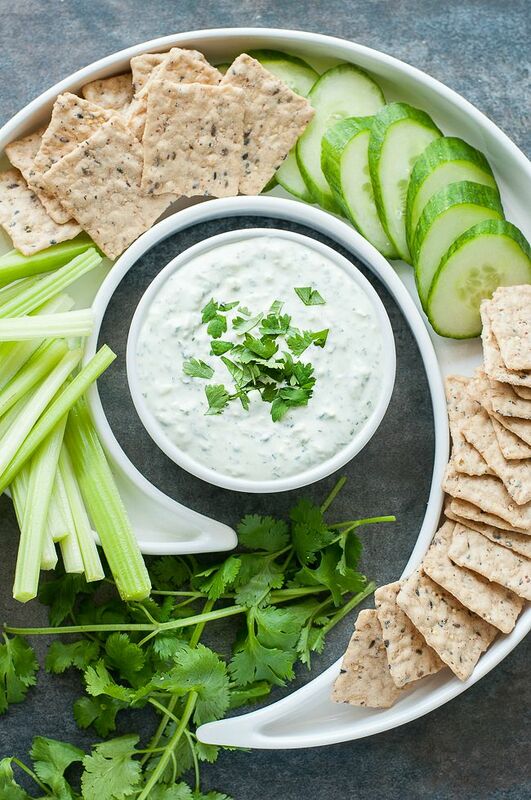 This Creamy Cilantro Cucumber Dip cool, creamy, refreshing, and basically screams Summer. Trough a megaphone. At the top of a mountain. Now if you’ll excuse me, I need to go make another bowl before I start going through withdrawals. I suggest you do the same. See ya in the kitchen! Great flavor in this dip. Dipped with celery and artisan sesame crackers. Very Yummy! Love the dip ! Also LOVED the dish you used. Where can I find one. Absolutely Loved it. I just made this and it is soooo good I could actually eat it with a spoon!! I dipped cucumbers and crackers in it. So yummy! It s a good idea to let the dip mellow for a few minutes before adding the salt, I added a little too much the first time. Grate the cucumber. Giiiirrrrrllll, you know I love your dips. When I dip, you dip, we dip. And now you know my whole family loves your veggie burgers!! Fabulous flavors! Love both cilantro and cucumber – what a great combo! I need to check out these crackers – they look perfect for this dip! You just blew my mind adding cucumber to this dip! I love all things cilantro and the cucumber mixed in with this dip is a genius combination. The Nut Thins are the perfect scooper for the dip too! Duuuuuuuuuuuuuuuuuuuuuude. Yaaaaaaaaaaaaaaaaaaaaaaaaaaaaaaaaas! This dip looks amazeballs. I might just need to make this this weekend. Will isn’t a huge fan of raw garlic (or garlic for that matter) either! He likes it, but only in small amounts! Wow! This dip looks incredible, yum! Cucumber and cilantro…two of my favorites! I would go through this like crazy! It looks delicious! Love cool, creamy dips like this! I love the cool, creamy contrast of this dip against the saltiness of these crackers–love it!! I’ve totes been into cucumber lately. It’s really weird…I used to hate it. Like, a year ago. Pinned for latta! Ohh, definitely have to try out those crackers, they look so good! As does your dip, yum! 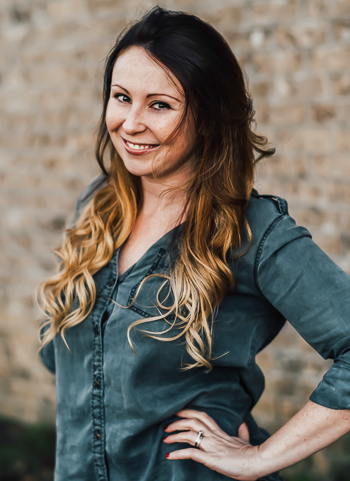 Dear Jenn – I love this delicious dip and that incredible server!!! What a lovely presentation. Cilantro is one of my favorites. Sure hope Katy gets that bowl back to you ASAP so you can fill it up with more of this yummy dip. Dip can be a hard thing to photograph and you nailed it! Gorgeous photos! I actually have a gluten allergy so I’ll need to keep my eyes out for these crackers! I love dips made with Greek yogurt. Any time you can add more protein you have a winner. Plus there’s extra protein in the crackers too! Jackpot! I think Katy is code word for your stomach. LOL! Well they BOTH love guac! This dip looks absolutely refreshing! Perfect for summer! This looks like one refreshing and healthy dip! So making this for myself tomorrow. Hope you adore it! Thanks Thalia! such a cool and refreshing combination. and i love those crackers! nobody every knows that they’re gluten-free. Thanks Amanda! And yes! They’re soooo addicting that everyone loves them! Ohmygosh this dip would taste SO GOOD over both! I hope you love it as much as we do! Thanks Melissa! This looks amazing! I also love your dip set, too cool!